One of the first things I recommend to people planning a visit to Lake Charles is WHAT TO EAT! I can’t help it – it’s always the first thought on my mind and there are so many delicious and unique food experiences in the area, I can’t help but talk about them. 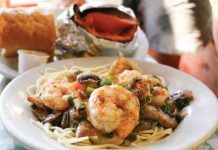 This foodie’s guide to Lake Charles features all of my favorite things to eat, see and do in Southwest Louisiana. And make sure to follow #eatswla on Instagram to find more local flavors to taste! Voted year after year as the #1 Local Favorite for fresh seafood. Make sure you try the fried shrimp, gumbo, and when in season, crawfish boiled to perfection! Luna’s has the coolest vibe, not to mention delightful menu items. You can’t go wrong with one of their seafood entrees like the Fish Apollo, but my go-to is The Venus. Gulf shrimp grilled and stuffed under a fresh jalapeño cheese sourdough bun with all the fresh avocado, tomato, and remoulade fixings. Good eats! You can’t visit Lake Charles without a stop at Darrell’s. 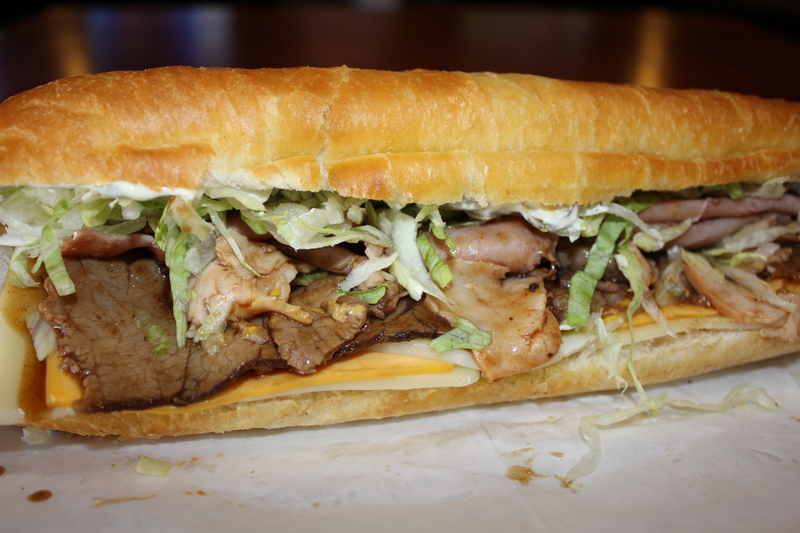 Known for their “Darrell’s Special” this sandwich will have you in po’boy heaven. Ham, turkey, and roast beef drowned in roast beef gravy with crunchy yet soft French loaf – YUM! Make sure to grab extra napkins, you’ll have gravy running down your sleeves for sure. My ultimate recommendation for out of this world craft cocktails and unique farm to table small plates is Restaurant Calla. My favorites – the handmade gnocchi and Moscow Mule. Make sure to try the blue crab beignets. Calla’s menu rotates with the seasons, so there is always something new to try. We’ve got more than just platefuls of food. We’ve got great drinks too. 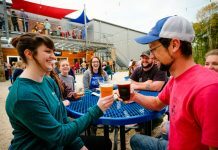 Crying Eagle Brewing Co. is one of the newest additions to the Louisiana Brewery Trail and their beers are GREAT! My husband’s favorite is their crisp rice lager “Louisiana Lager.” It pairs perfectly with pretty much everything Louisiana offers. Take a tour or just enjoy a few brews. You could easily spend an afternoon here. *Local Tip: Visit the first Thursday of the month for Food Trucks Invade! Boudin is a must and eating it guarantees that you will leave as my aunt says, “Fat, dumb and happy.” The best way to taste this local favorite is by travelling the Southwest Louisiana Boudin Trail. My favorite stop is, The Sausage Link where you can not only purchase boudin links, balls or cracklins, but also see how boudin is made. Adventure Point tells the story of our culture and unique landscape. Its hands on exhibits also feature culinary lessons in Cajun vs. Creole, Cajun seasonings and traditions. Added bonus, if you plan on visiting the Creole Nature Trail during your visit – this is the perfect launch pad. The area is known for casino resorts, with four casino complexes in the area. 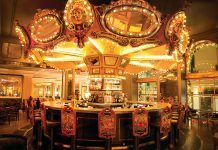 Golden Nugget Lake Charles, L’Auberge Casino Resort, Delta Downs Racetrack Casino & Hotel and the Isle of Capri Hotel Casino all have exceptional amenities but one pleasure they all share is a variety of fabulous restaurants. So when you’re not on the golf greens, enjoying a spa day and lazy rivers, or playing the slots, make sure you treat yourself to some outstanding meals. If you’re interested in the Cajun French flavors special to Southwest Louisiana, you’ve got to attend a Velvet Pig Cooking Class. 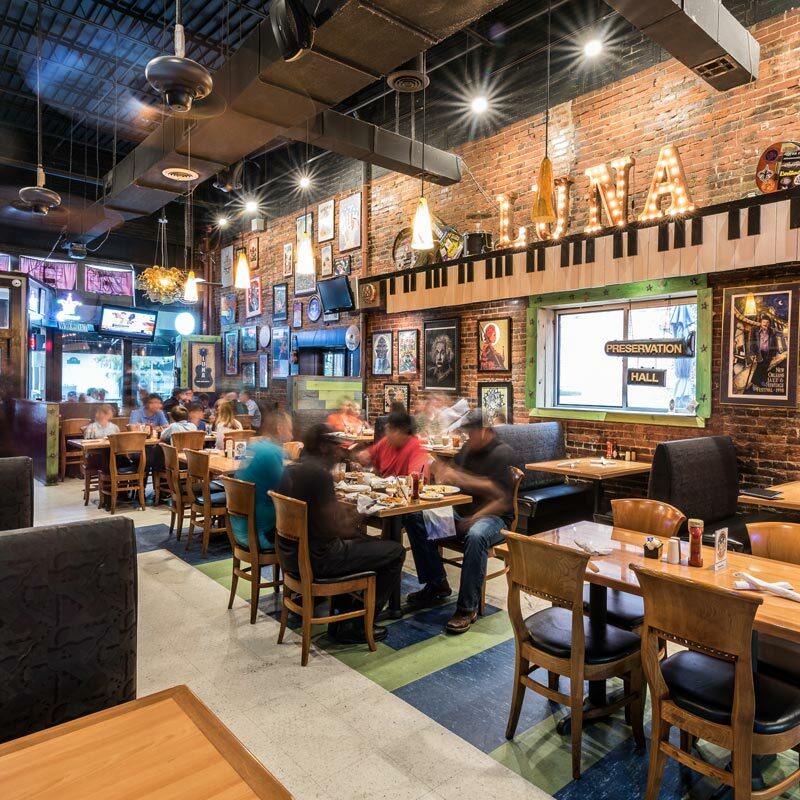 The Velvet Pig’s recipes highlight the region’s most popular recipes like jambalaya and étouffée as well as classic French dishes that inspired Cajun cuisine. Most ingredients are sourced from local farmers markets, plus it’s a ton of fun! Southwest Louisiana is the only part of the state that has year-around farmers markets. Lucky for us, we have five! The markets vary from location, dates and times; but you can always count on fresh, locally grown/made products. The Cash and Carry Farmers Market is one to beat with tons of vendors, live music and samples! The Louisiana rum tradition is brought to life by the Louisiana Spirits Distillery. See first-hand how the company’s popular Bayou Rum is produced during free tours offered Tuesday-Saturday throughout the day. Live Zydeco bands plus brunch? Does life get any better? 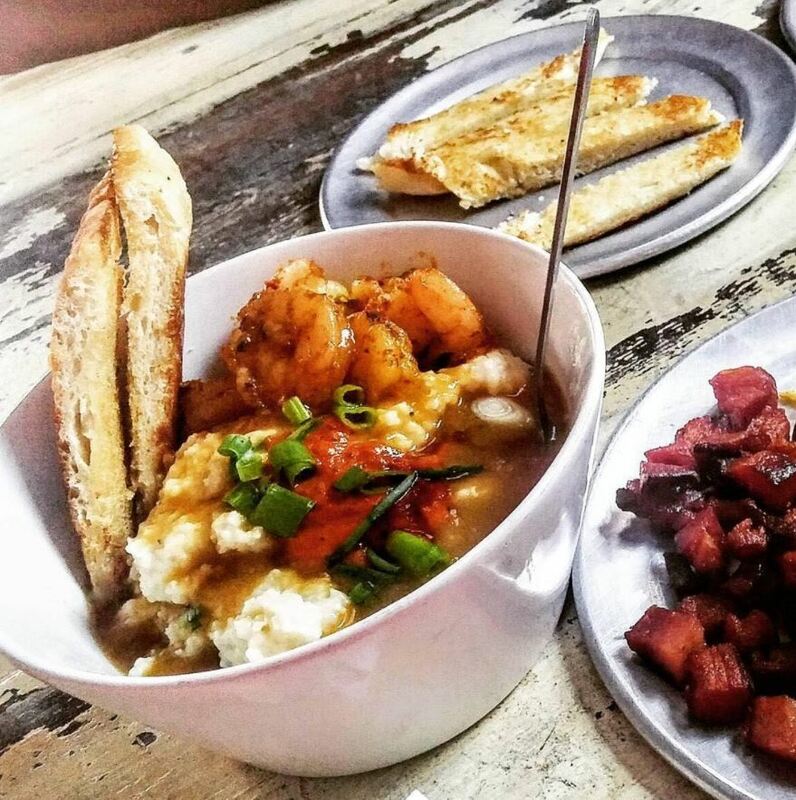 You’ve got to order the shrimp and grits with goat cheese, Steen’s syrup gastrique, and signature pie-yow sauce. The open-faced oyster po’boy also comes highly recommended. Add a Bloody Mary or Mimosa and you’re set. Lake Charles has endless things to eat, see and do. Visit for a weekend and explore some of the best foodie spots featured here or stay for a week and explore all that the area has to offer.